The city will feel the same. 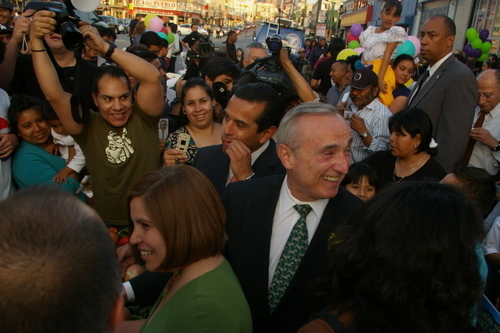 Tamales de la Paz co-sponsors Councilmember Ed Reyes and Mama’s Hot Tamales’ Sandi “Mama” Romero were joined by Chief William Bratton and Mayor Antonio Villaraigosa to speak to a small crowd in front of the popular tamale café. If there was trepidation, it wasn’t heard when Romero saw Langer’s Deli owner Norm Langer and quipped "Pretty soon, we'll have a pastrami tamale." Villaraigosa assured the crowd that "The city has learned the mistakes of the past" after Bratton declared the night a chance to celebrate at MacArthur Park “as a positive experience and remove the negative experience of last year." 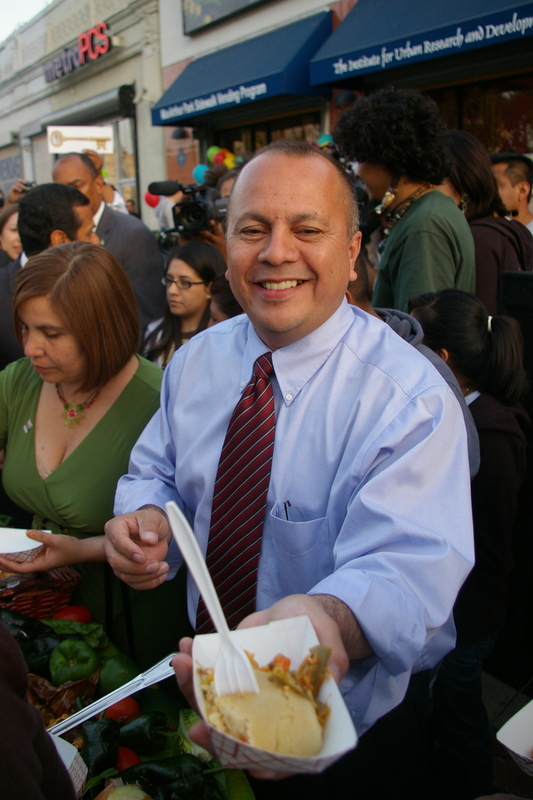 Still, for Councilmember Ed Reyes, the May 1 march is an unpredictable gathering of civic family in a park, saying "You don’t know what that one uncle will do." It may have started out the right way last night as locals, business owners, media and LAPD broke husk together at the table of a 10 ft platter of tamales. 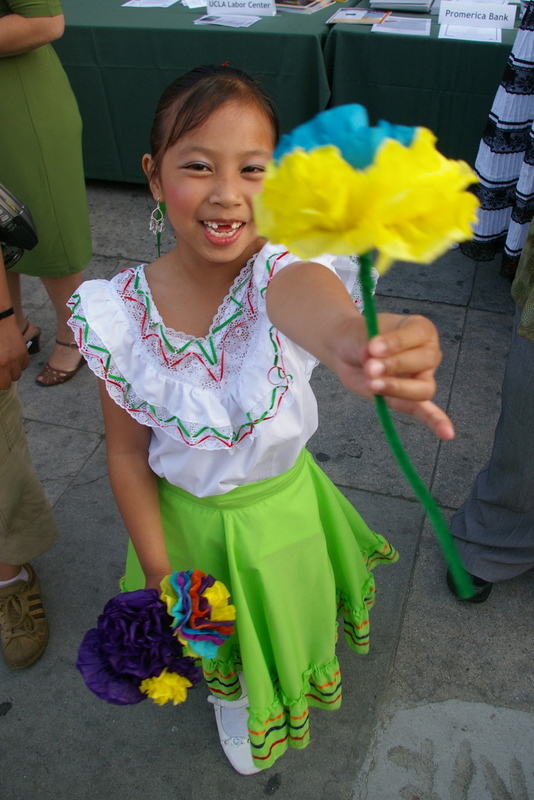 The Mayor was cheered when he downed a jalapeño, Reyes served up come vegetarian tamales, children ran past the legs of the Chief with colorful paper flowers to offer to the crowd, and an old man with a face creased from a lifetime of working in the sun beamed in approval. 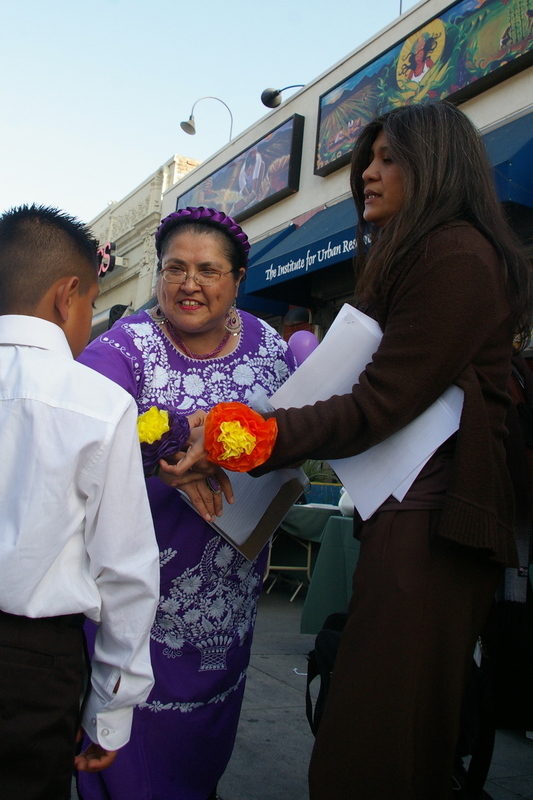 Children from the MacArthur Park Primary Center passed out flowers while Ed Reyes passed out tamales. 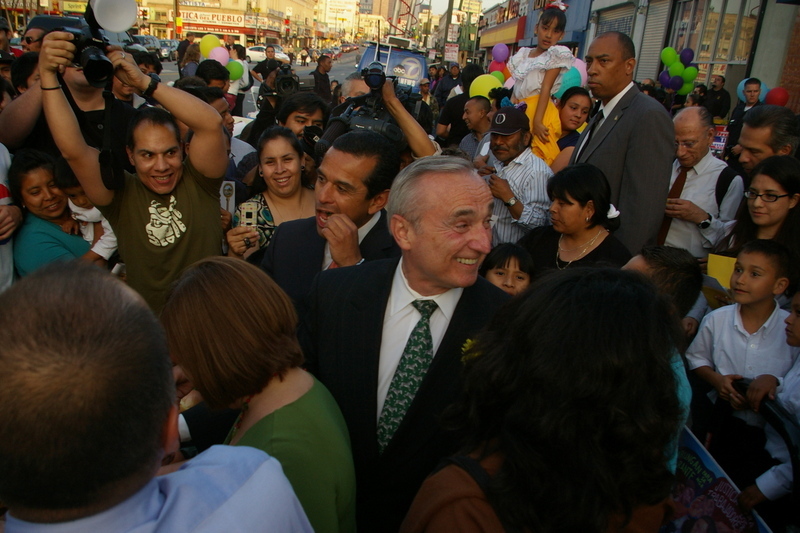 Sandi “Mama” Romero gave instructions, while Mayor bites into a jalapeño and the Chief joined in what Bratton called "setting the stage for a celebration day."